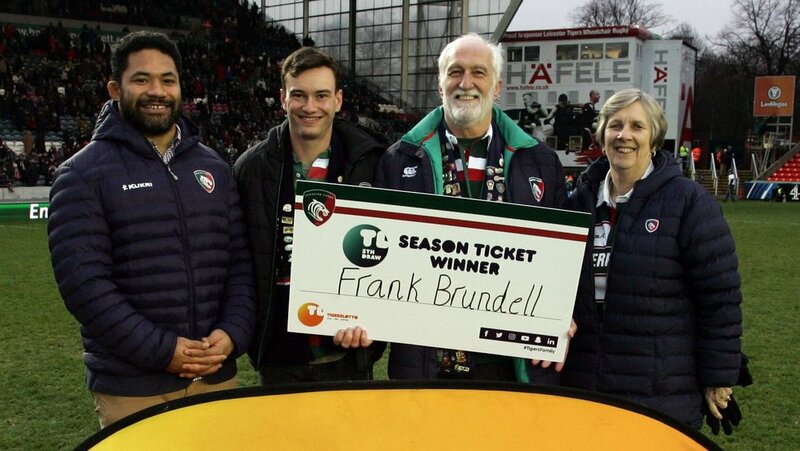 Frank Brundell is the latest TigersLotto season ticket draw winner and was presented with his prize on the Welford Road pitch at half-time in Saturday’s European Cup fixture against Ulster. Frank, from Leicester Forest East, sits in the Holland and Barrett Stand and was joined on the pitch for the presentation by wife Trudy and his grandson Zak Anderson. The TigersLotto season ticket draw is held at every home game, with the winner receiving the cost of their season ticket. TigersLotto also provides daily chances to win great prizes while knowing your support will also help to develop the Leicester Tigers academy and community work through the Leicester Tigers Foundation.